After having just returned from a brief outing at my favorite spot in Maine, it seemed appropriate that this week’s At Ease should feature that location. As I started to put together the collage, I realized how many iconic products associated with Down East are actually made in the state. 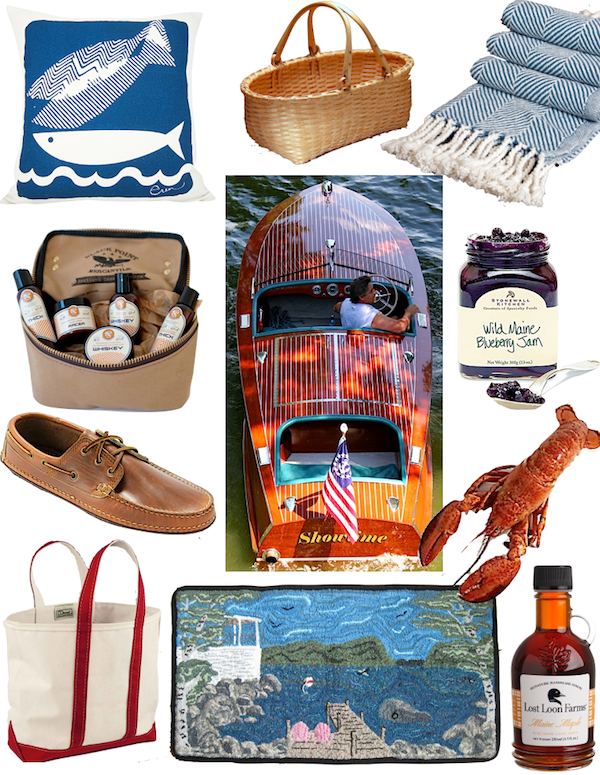 So you can be sure that each of the items included today are indeed made in Maine, many by hand. You just can never have too many L.L. Bean boat totes. I use them for everything from laundry bags to beach totes to truly anything that needs schlepping. And I am frequently checking the site because they sometimes include some fun specialty bags – last year they had an adorable one with a lobster screened on it that would have been perfect for this post! Quoddy boat mocs continue the heritage of a made in Maine classic. Their handsome versions are hand sewn with true moccasin construction for a glove like fit. Portland General Store is only making 100 of this limited edition dopp kit. Made in conjunction with a local Maine-based bag maker, the cotton duck bag includes TSA friendly sizes of 5 of their best selling men’s grooming products, from whiskey aftershave to racer shave cream. With charming vintage style packaging, their products are all natural and don’t include any fragrance oils or chemical additives. You may recognize Erin Flett’s whimsical Tuna Fish pillow. Her bold graphic designs have been featured in many publications and books. Each pillow is hand screened with eco friendly water based inks and stuffed with hypo-allergenic faux down. She features many fun patterns and colors in her stylish and affordable etsy shop. Each of Stephen Zeh’s baskets is hand crafted in Maine of local brown ash using traditional tools in the same way they were by Shakers and Native American basket makers. While I particularly liked this large oval carrier, they are available in many different shapes and sizes, including miniatures – truly a form of functional art meant to last a lifetime. I’ve owned Brahms Mount blankets and throws for years. Using natural fibers, their products are heirloom-quality with a soft hand and classic designs. Made on antique looms by trained artisans, their made in Maine textiles also make great baby and house warming gifts. I’m sure most of you are familiar with Stonewall Kitchen, but you may not know that their hugely successful business started with a jar of jam. So as a Maine based company, it seemed only fitting to feature their delicious Wild Maine blueberry jam. Jonathan King and James Stott have a great story and their focus on the “highest quality tasting and best looking products possible” has turned out to be a winning combination. Maine is synonymous with lobster and not only can you get fresh lobster shipped to you but you can actually lease your own lobster trap. With Crate to Plate you can sign up for a two, three or six month lease. Once the lobsters are caught, they are delivered to your door within 24 hours via FedEx. You can even track your trap on a map that shows the location of all traps set throughout Saturday Cove & midcoast Penobscot Bay. A full season would net you somewhere between 40 and 60 fresh lobsters for the year! Lost Loon Farms creates small batch, all-natural artisanal fruit preserve & condiments. The ingredients are grown by the best Maine growers and family owned farms, with whom Lost Loon has personal relationships. And for each purchase from Lost Loon Farms, they donate 15% of the sale towards the Maine Audubon’s Loon Project, which supports research and education on behalf of loons and their habitat in Maine. I have always loved hooked rugs. Not only are the beautiful and charming but tell a story. Parris House Wool Works has only one leg in Maine, with owner Beth Miller, who created the company with friend Jennifer Rosenburg of Tennessee. This rug represents a custom commission they completed last year, but they also have rugs for sale in their online shop. Stay tuned for some more Maine magic coming up. This entry posted in At Ease, design, fashion, food and drink, gifts, interior design, travel. Entry Tags: Hand made, Maine, Maine products Bookmark the permalink. What a treasure trove. I will save this one for holiday shopping to come. Thank you, Stacey. Than-Q for blogging about the many fine Maine artisans and their wares. You can find all these and over 1,700 more Maine artisans and craftsmen profiled on our website at: http://www.mainemade.com. i loved everything maine – ish that i have moved here. Stacey, all of these are really special Maine creations!! Thank you for showing such a variety of artisans. I also love the painted furniture found at mainewoodworks.com. But of course I love anything made in America! 79 queries in 0.487 seconds.